Nature: wild & untouched. Photographing it, preserving it, taking walks and drinking in the landscapes as they unfold. Gardens: touched by loving hands. Cultivated, nurtured. Drinking in those landscapes is wonderful, as well. In my garden one enjoys some of both. Generally unpruned & wild, my plants reshape the garden as they grow. Beyond the garden borders, natives from the Santa Monica Mtns await. Oak trees with their shady canopies. Cactus & Sage in the sun. Always there are animal creatures to join in the fun. I look forward to sharing some of my experiences with you as they unfold. As the month of January comes to a close and folks out on the East Coast are digging themselves out of their first blizzard of the 2015/2016 winter season, I can't help but think how lucky we are to be able to provide winter homes for the west coast Monarch butterflies. There are many things to do and places to see in So Cal in the winter months -- the Rose Parade in Pasadena comes to mind immediately -- but there are also many surprises awaiting visitors, such as the arrival of orange winged beauties at California Monarch Butterfly Sanctuaries. 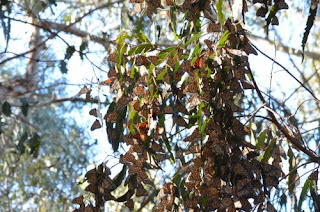 Unlike the long journey of East Coast Monarchs, who famously fly thousands of miles across the border into Mexico to overwinter each autumn, there is a lesser-told story of the Monarch butterflies living west of the Rockies who would rather hibernate (overwinter) here on California’s coast than fly all the way to Mexico as their East Coast cousins do. In late autumn, West Coast Monarch butterflies can be found congregating in any one of California’s Coastal Groves, where they will remain throughout the winter months. There are over 200 different overwintering sites on California’s long coastline, and thousands of western monarchs spend their winters there. During the months of overwintering (which can be thought of as a sort of hibernating), the Monarchs will not need food. In fact, they will eat as much as they can during August, Sept & early October, just gorging themselves to stock up for the winter. It is not food they need in the winter so much as water to drink, and the ocean mist from a well-chosen coastal grove assures them of that. The west coast monarchs will find each other at the same overwintering groves once selected by previous generations. Somehow they will know where to go, even though they have never been there before. They will hunker down together in the Eucalyptus trees, huddle close together for warmth, and close their wings tight to ward off any chill in the night air as they sleep. Trained volunteers conduct annual monarch counts around Thanksgiving Day. Some sites, such as the Pacific Grove Monarch Butterfly Sanctuary (PGMBS), monitor the monarch population more frequently. PGMBS is a wonderful place to learn about the monarchs, as the docents there are very well-informed and happy to share information. You can also learn more from the exhibits at the Natural History Museum, and stroll through the native plant garden with its butterfly-friendly blooms. If you visit in January, the monarchs will be readying themselves to leave the roost. There will be fine acrobatics to watch, as the males & females have their last big mating fling. When the monarchs to do leave, they do not leave all at once. Unlike a migrating flock of birds, Monarchs act as individuals. They decide on their own “where and when” to go, though they will all be gone within days or weeks of each other. The females will fly off to find Milkweed plants on which to lay her new egg larvae; they will die soon, and the larvae will be the next gen of monarchs left to carry on. The new generation will know of the Grove and how to find it, even though they have never seen it themselves. Thanks for reminding your readers that the old growth Sycamores were the preferred habitat. "Girl with an eye for nature's beauty." Santa Monica Mtns, gardens, native plants, trees, landscape photography, design, flowers, poetry, hummingbirds,wildlife. How Can You Paint Your Garden Blue? Summer is Here! Bring on the Fruit! Free Plants By Mail ~ Saving the Planet One Plant at a Time!